Wells. J.V., and A.C.Wells. 2017. 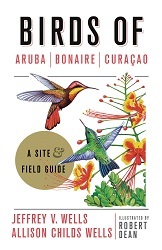 Birds of Aruba, Bonaire, and Curacao; A Site and Field Guide. Cornell University Press, Ithaca, NY. 474 pp. conservation. Cambridge, UK: BirdLife International. (BirdLife Conservation Series No. 15). Wells, J.V., and A. Debrot. 2008. Waterbirds in Bonaire. Wells, J.V., and A.C. Wells. 2006. The Significance of Bonaire, Netherlands Antilles, as a Breeding Site for Terns and Plovers. Journal of Caribbean Ornithology.19:21-26. Wells, J.V., and A.M. Childs Wells. 2005. First Record of Caribbean Martin (Progne dominicensis) for Aruba. North American Birds 59:670-671. Wells, J.V., and A. M. Childs Wells. 2004. Photographic Documentation of Philadelphia Vireo on Aruba. North American Birds 57:562-563. Wells, J.V., and A. M. Childs Wells. 2002. Extreme Extralimital Summer Record of Western Tanager (Piranga ludoviciana) from Bonaire, Netherlands Antilles. Cotinga 18:96-97. Wells, J.V., and A. M. Childs Wells. 2001. First Sight Record of Philadelphia Vireo (Vireo philadelphicus) for Curacao, Netherlands Antilles, With Notes on Other Migrant Songbirds. El Pitirre 14:59-60. Wells, J.V. 2002. For the Island of the Yellow-shouldered Parrot. Birdscope 16(1).